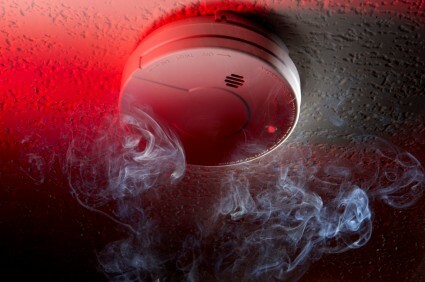 Will you hear your smoke alarm if it sounds in the middle of the night? How about your parents or elderly neighbors? New regulations for smoke alarms will help make sure you hear the alarm, even if you suffer from impaired hearing or high-frequency hearing loss. December is a time to cozy up in front of a warm fire, which reminds us that it’s also a great time to check your smoke alarms. Test the batteries to make sure they work, and check the sound on the alarm to make sure you can hear it. Smoke alarms traditionally emitted tones at 3100 Hz, a fairly high frequency that is easily heard by those with normal hearing. But people with high frequency hearing loss may not be able to hear these sounds if they’re not wearing their hearing aids – like when they’re sleeping. Last year, the National Fire Protection Agency (NFPA) revised the fire code, so now smoke alarms have lower frequency tones (around 520 Hz), allowing the alarm to alert a greater number of people. While almost all adults with normal hearing will be woken up by a high frequency fire alarm, only half of adults with hearing impairment will be woken by the same alarm. The low-frequency alarm alerts everyone, whether they have high frequency hearing loss or not. The lower tone is also better for waking children, and those who are under the effects of alcohol or sleep aids. In addition to the low frequency tone, some alarms come with strobe lights that flash when the alarm goes off. Alarms can also be connected to vibrating devices that will shake the bed so someone who may not hear the alarm can still be alerted to a potential danger. The new NFPA codes also apply to carbon monoxide detectors, meaning that these alarms must also emit low-frequency sounds so more people, including those with hearing impairments, can hear them. Carbon monoxide detectors can also come with lights and vibrating devices, making them suitable for people with all types of hearing impairments. Fire and carbon monoxide emergencies can happen at any time. Keep everyone in your home safe by making sure you have alarms that work for everyone. Speak to your audiologist about what alerting device is best for your needs so you can sleep both safely and soundly.